‘Spanish Colonial’ made from mesquite wood. The design of this bed has such simple form it can transition into any home style. 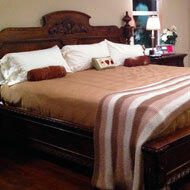 The complete bed comes with a headboard, footboard and side rails. It can be ordered in all sizes. Pricing for Cal king $3,200. Queen $ 2,800. 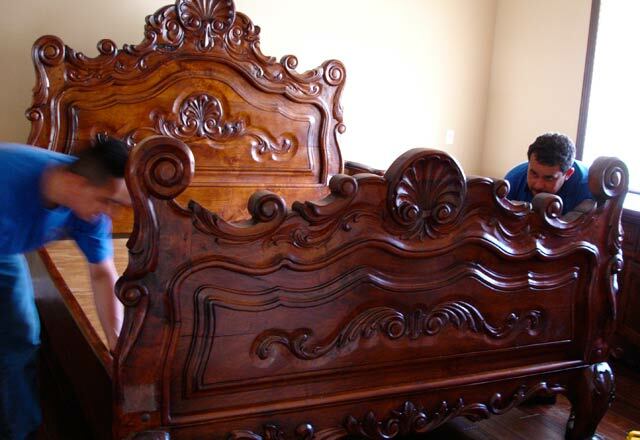 Looking for just a headboard we can do this too. 'Margarita' It starts with the basic Spanish colonial frame then the craftsman add a fine hand carved detail around all the panels creating its own distinctive style. As like the Spanish colonial it comes as a complete bed. Pricing for Cal king $3,800 Queen $3,200. It can be ordered in any size. 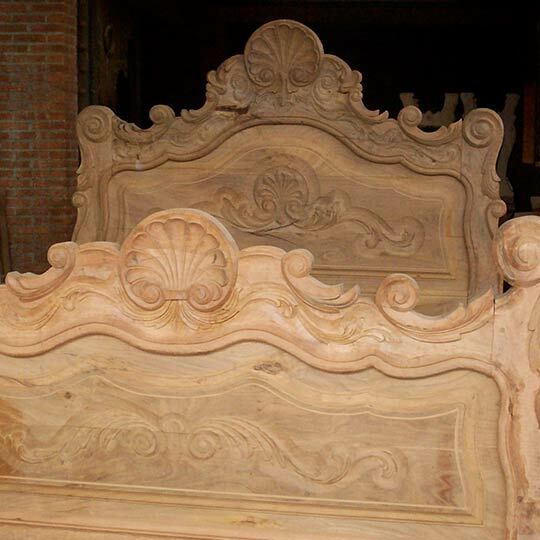 ‘Concha’ a sophisticated and ornately carved bed perfect for the Classical Spanish, Tuscan or Mediterranean style home. 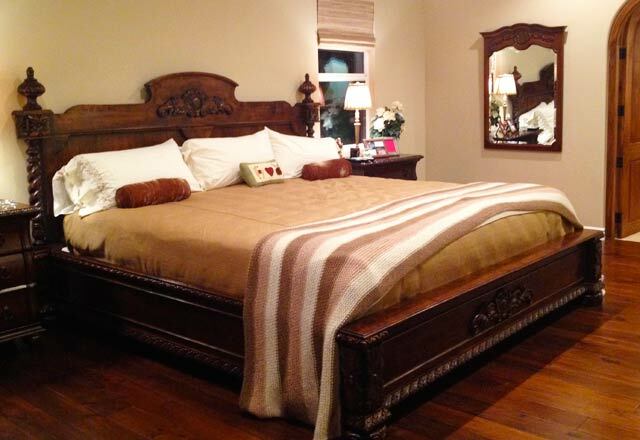 The beds are made from mesquite wood. Creating a beautiful piece of furniture which will be handed down through generations. 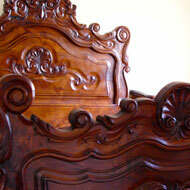 Prices are quoted according to the amount of carving and size of beds. 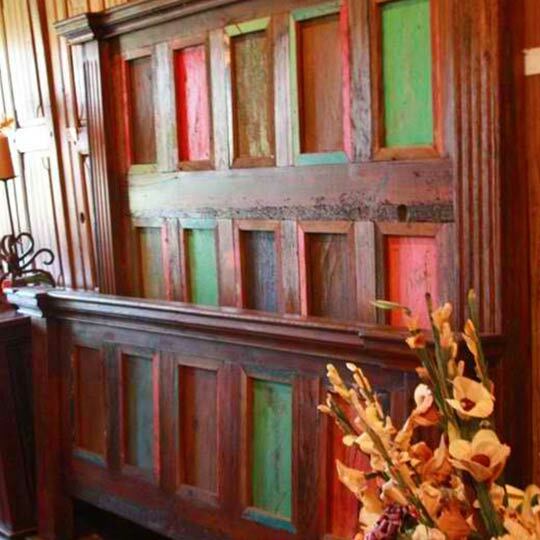 Antique Mexican Doors ‘La Puerta’ Do repurposed and rustic doors interest you? 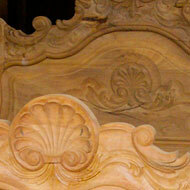 Select from our vast collection of antique Mexican doors for a one of a kind headboard. 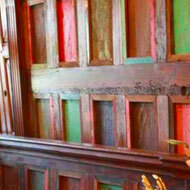 The age, natural elements and history of each of these doors has given each one it’s own patina that only time can create. You can even choose from a variety of doors that have their original color. Most all the doors have there original hardware of nails, key locks and ringed hinges. Pricing is by wood species, size and age. Wrought Iron Many different styles to order from. Choose just a headboard to a complete bed. You can also bring in a picture and we will quote a price for you. Custom Our wood and iron craftsmen in Mexico are capable of making almost any size and style. When it arrives in Newbury Park at our workshop our craftsmen will hand finish each piece beyond your expectations. We encourage you to bring us an idea, picture or drawing. We would love to work with you on developing and then creating a piece thats fits your space and lifestyle. © 2017 CASA MEXICANA IMPORTS. ALL RIGHTS RESERVED.